Lexus Magazine, the monthly owners magazine from Lexus USA, has recently made the switch from print publication to part of the Lexus Drivers website, and are now looking for feedback on the changes from Lexus Enthusiast readers. 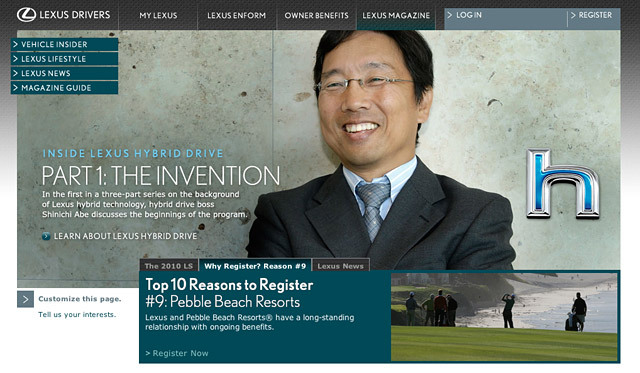 My own experience with the old Lexus Magazine was limited to reading PDF versions, and for the most part it focused on non-automotive lifestyle stories—the new format is a much more balanced affair, featuring automotive features like hitting 85mpg in an HS 250h and insight into the creation of the Lexus Hybrid Drive. It’s a great step in the right direction—I’m especially interested in the features that show the engineers and designers behind the cars. So take some time, look through the magazine, and then share your thoughts in the comments. Thanks!